Image credit: A Community Solar Farm, SEPA. Community solar power is one of the fastest growing segments of the solar industry in the US and it's allowing more people, municipalities and companies to get their electricity from clean, reliable solar power than ever before. Just a few short years ago there were only a few projects spread out across a handful of states. Now the US is expected to surpass 1 gigawatt of community solar farms this year. It's an ideal alternative when someone wants to go solar on their home or business but can't. 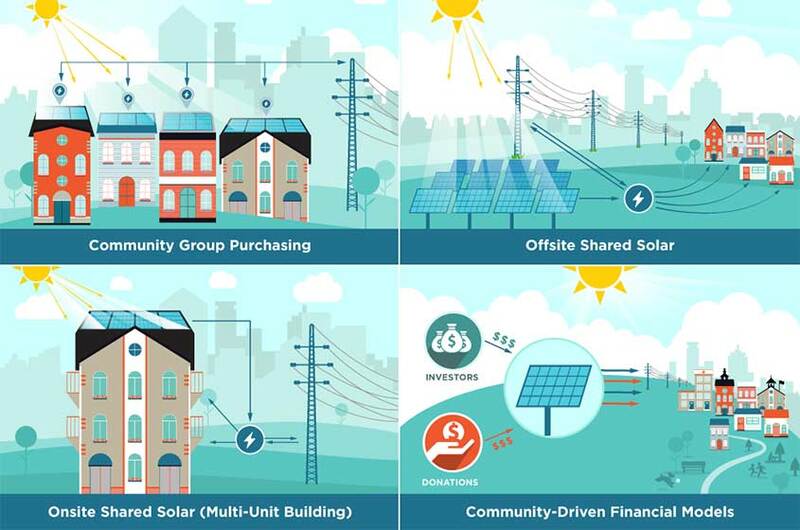 So what is Community Solar? Image credit: Department of Energy, Community Solar Designs. Community solar also called shared solar, refers to a number of arrangements where utility customers can sign up to get solar power from an installation that's not on their home, facilities or business. It also gives those living in an apartment a chance to go solar even though they don't own their home. The majority of community solar projects consist of a solar garden or solar farm located at a site determined by a utility or developer to maximize the amount of energy the system can produce and to not put too much stress on the electric grid. Such systems are also known as offsite shared solar plants. However in other instances, like a condo or apartment complex, a community solar project could be installed on the rooftop or other parts of the complex allowing residents to opt-in to get power from the rooftop solar array. Similar to paying for solar on your rooftop, there are options for financing community solar power, explains Jeff Cramer, Coalition for Community Solar Access' (CCSA's) executive director. CCSA is a non-profit organization advocating for community solar. "Many of the same financing mechanisms available to onsite solar are available through community solar providers—from leasing for projects owned by the provider to private financing for owning panels. Community solar providers can introduce customers to various forms of financing based on the market in which they are located." Depending on where you live, you might be able to buy panels in a community solar farm and get reimbursed for the energy they produce and put on the grid. Or the solar farm provider might offer a power-purchase arrangement, wherein customers pay a set monthly amount for their portion of the solar farm and are reimbursed for the power those solar panels produce on their energy bill. Similarly, they may offer a virtual net-metering arrangement where people are reimbursed or credited for the energy produced by their portion of the solar farm. 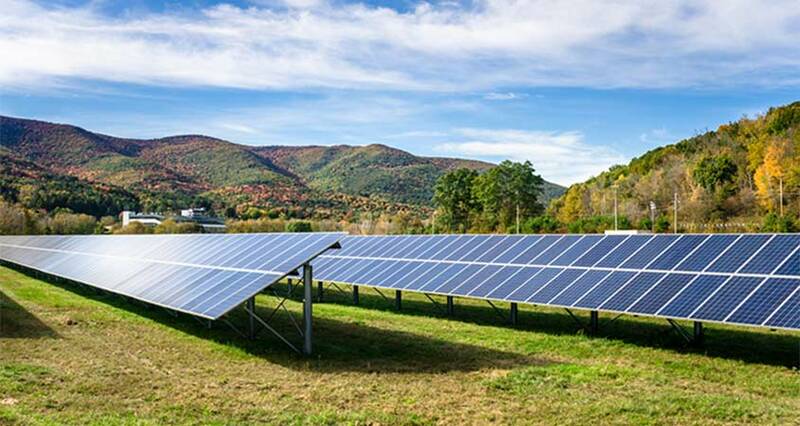 Clean Energy Collective (CEC), with 74 projects comprising 80 megawatts of community solar projects online and a total of 304 MWs in its pipeline, is the largest provider of community solar farms and services in the country. It offers customers its Roofless Solar Program. "That's what we use in each of the markets we serve," says CEC spokesperson Tim Braun. "We offer two types of products, an ownership model and a pay as you go model," Braun says. He explains that the pay as you go model is a subscription model. "In some markets we offer both." What are the disadvantages of Shared Solar? Availability. First off, the biggest disadvantage is it's not available everywhere. The Community Solar Hub, a project of CEC and the Department of Energy showed that there were 101 community solar projects across 26 states by early 2017. At that point, there were about 108 megawatts of community solar available across the country. While that's a slight majority of states, it shows how limited the spread of community solar still is. Still, it's one of the fastest growing solar segments in the country. "Until two years ago we only had tens of megawatts in the ground. Now over 700 megawatts are on line, and that figure will cross a gigawatt later this year," Cramer states. As of early 2018, that number's already grown to at least 31 states and Washington, DC. Community solar projects are available in Arizona, California, Colorado, Connecticut, Delaware, Florida, Georgia, Indiana, Iowa, Kansas, Kentucky, Maryland, Massachusetts, Michigan, Minnesota, Missouri, New Hampshire, New Mexico, New York, North Carolina, Oregon, Pennsylvania, Rhode Island, South Carolina, Tennessee, Texas, Utah, Vermont, Washington, Washington, DC, Wisconsin, and Wyoming. Laws and regulations. There's some policy uncertainty around community solar. New Jersey recently became the 18th state in the US that has passed community solar legislation, according to Cramer. Since some type of community solar projects are already installed in over 30 states, some utilities and communities have pounced on the community solar opportunity even before state legislatures can create policy. This could create headaches for some consumers already benefiting from community solar if the state or utility decides to change how community solar is regulated and how people pay for, or are reimbursed for the solar power they signed up for. Still, Cramer maintains that “the reality is that community solar is scaling and maturing, Cramer said. “Now that we have some programs with a few years under their belt we're seeing best practices emerge and the differences between best practice and challenging program designs are clear,” he says. The organization is developing model legislation and policy tools to ensure community solar policies follow best practices for all players: consumers, project developers, utilities and grid managers. Still young. A potential disadvantage of opting into a community solar program is that, again, a relatively young application of photovoltaics and technologies allow it to happen. Not all proposed projects get completed for a number of reasons. The number of subscribers or customers who sign up for a project may not be enough to finance its construction. The developer or utility might not have the experience or knowledge to build the project. SRECs. Another potential disadvantage to community solar is the ownership of solar renewable energy certificates or credits (SRECs). Some states have markets for SRECs allowing renewable customers a chance to sell them to further reduce their energy expenses or to keep them and force the utility to add in even more renewable energy to meet their renewable energy requirements. Many community solar farm agreements don't spell out who these SRECs belong to, but instead of offering them to consumers directly they can be used to further reduce the cost of solar from the farm. Contracts. Depending on the customer's living or business situation a long-term community solar contract could be difficult to get out of if a person or business moves. Thankfully most community solar contracts realize that and can allow for those who move or those who may have an opportunity to go solar on their own to change or end their contract with the community solar provider. In fact, owing to the popularity of community solar projects many have a wait list of consumers eager to opt-in to community solar projects. How much can you save with Community Solar? CEC promises savings on energy bills, but states that they'll vary depending on the amount of energy you contract for. That's thanks to the arrangements it creates with utility companies, its ability to achieve lower costs on equipment by making larger purchases and the ability to site a solar array in a way that it can generate the most solar energy in the region. "If you are a subscribing customer, the average payback rate of a RooflessSolar system will vary from 4-8 percent, but will be fixed and detailed in your personal proposal," CEC states in its FAQs. "If you decide to purchase your panels, the payback period can range from as few as 5 years to 15 years." That's dependent on your state and the costs of energy. Once the panels are paid for net savings will accumulate for the rest of the solar farm's life. However, that's just the offering from CEC and it varies from state to state and even within a state depending on the local utility and the community solar company it's working with. The best way to find out what your savings could be is to see if community solar is available in your area. How much can you save with Community Solar in your area? Where can I sign up for a Community Solar program? Your utility should be able to tell you if there are any community solar projects that you can sign up for. But you should also check with local commissioners and solar installers to see if any local community solar options exist. To see if a CEC project is available in your area, you can input your ZIP code on its site www.rooflesssolar.com and it will show you any projects locally available. 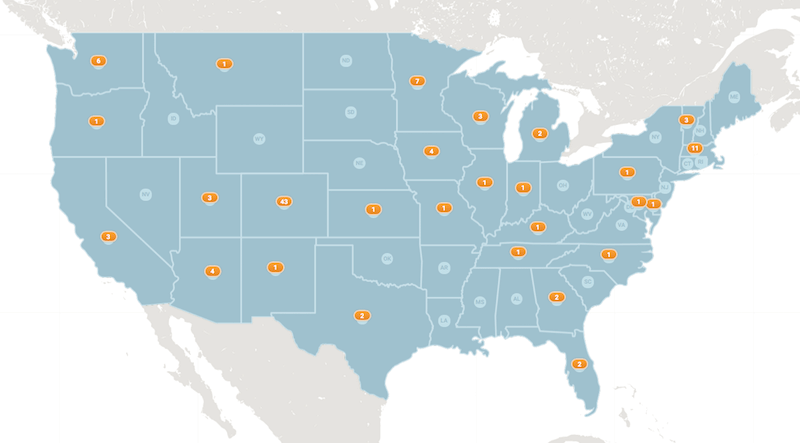 In addition, Community Solar Hub has an interactive map of many community solar projects across the US. You can click on or input your state on this and learn more about projects available locally. If there's not a project locally, don't worry, it's likely there will be soon. As Cramer explains: "GTM Research has showed that the potential for community solar is seven times that of residential rooftop's addressable market." He adds, "Rooftop solar has been, and is, a great option for those who can access it, but NREL has shown that only a minority of customers can place solar on their roofs." Cramer says those can't put solar on their roofs include those with a shaded roof, and those that live in an apartment or condo. "This lack of access to solar for many can be seen in the pent up demand for community solar," he asserts. How much will it cost to install a solar panel system on your home?